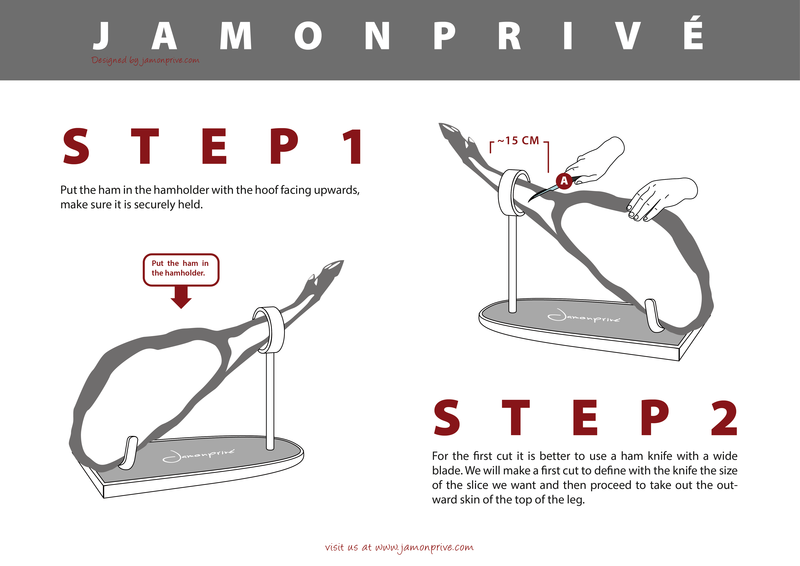 For avid Spanish ham fans, it should not be hard to tell whether you're looking at a good ham or not. But you might wonder whether you're dealing with an Iberico ham or a Serrano ham. What real difference is there between the two, and where did those differences come from? Is Serrano a special breed? Are the pigs fed differently for the two types of Spanish ham? Why would you choose one over the other? While it might seem that we're talking about two very similar products, especially at first glance, in fact there's a large difference between Iberico and Serrano ham, with the two having very different aromas, flavors, colors and textures. This despite the fact that ultimately, a leg of pork is the origin of both products. 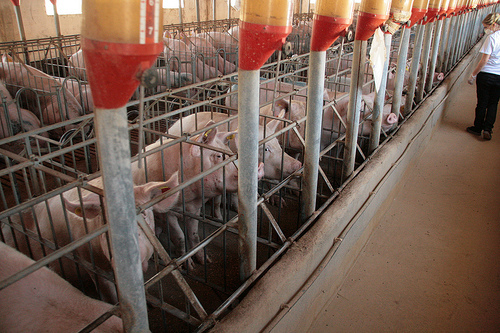 Differences in the breeds of pigs used, the curing methods and the feeding regime of the pigs all contribute to this divide. 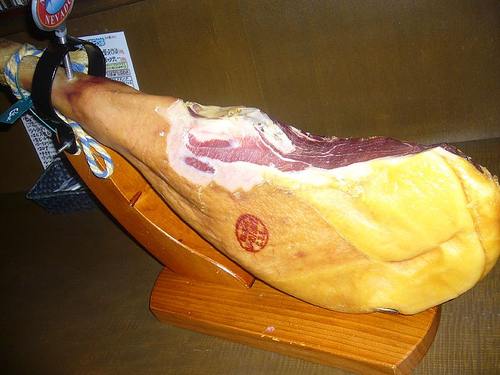 In short, these organoleptic properties to which we refer are the aroma, flavor, color and texture of the Spanish ham. Using these, we can establish some of the most important differences between Iberico and Serrano ham. In terms of aroma, all experts agree that Iberico ham has a unique aroma that is hard to miss and even harder to mistake for anything else. There are clear color differences too: Serrano tends to be a pinkish color, in contrast to the deep bright red of Iberico ham. In terms of flavor, a good Iberico ham is distinguished by a more intense falvour and a juicier texture, due to the quality of intramuscular fat present in the ham. Meanwhile, the Serrano equivalent tends to have a saltier flavor. Finally, Serrano tends to a less juicy texture due to a lower proportion of intramuscular fat, and Iberico tends to have a more rugged texture. However, we don't need to taste or feel a Spanish ham to know whether it is Iberico or Serrano. We can distinguish at a glance if we know what to look for. 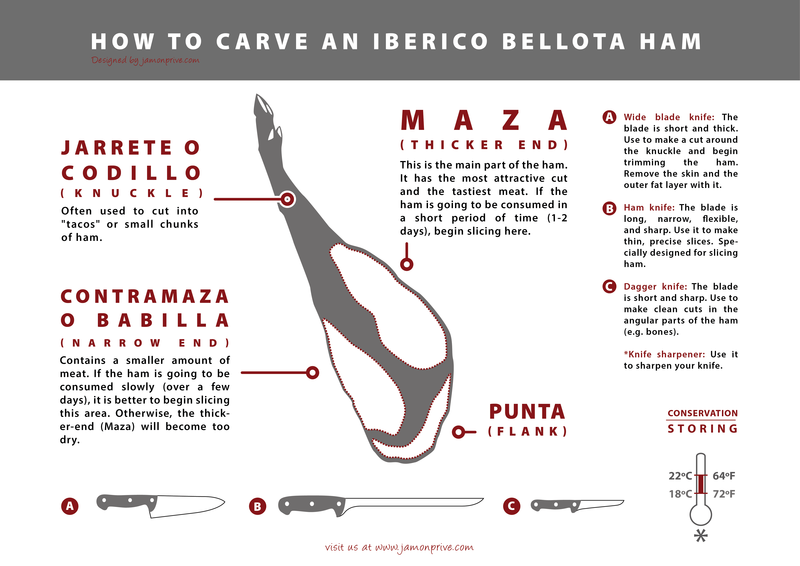 Iberico is typically a longer ham with an elongated shape and a narrower bone, and typically ends on a black hoof. If you can't tell by looking at the ham directly, look at the price: Iberico is much the more expensive of the two types, with its increased quality reflected in a larger price tag. The main difference between Iberico and Serrano ham is the origin of the raw material - the type of pork that's used. Iberico ham has to come from pigs that are at least 50% certified Iberico breed, and can only be mixed with one other breed: White Duroc. 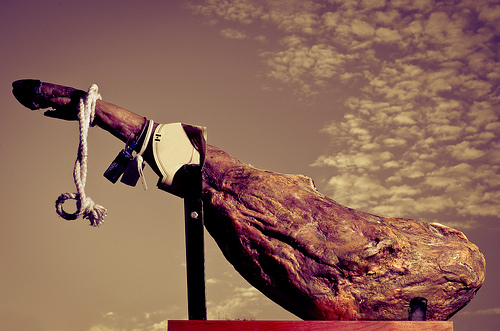 The highest quality Iberico ham is considered to come from 100% Iberico pigs. This breed is black with a long snout and has little fur, and is genetically predisposed to storing up fat between its muscles, meaning that when it's hung to cure the flavor from the fat is absorbed into the muscles. This is just one reason for its popularity. Meanwhile, when we speak of Serrano ham, we can see that we're referring to any non-Iberico pig breed. 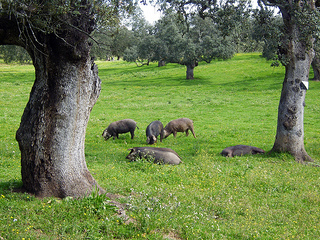 Serrano can be made from mixed-breed pigs with a small amount of Iberico blood, but it's more usually made from White Duroc, Large White, Landrace and Pietrain. Another factor is the feeding regime. Iberico ham is considered to be 'graded' based on what the animal has been fed and fattened on, with the 'montanera' ('mountain pasture') regime resulting in the best flavor and most prestigious product. This means the pigs have been reared and fed in mountain pastureland, eating wild grasses and acorns, resulting in the 'bellota' flavor that characterizes the very best Iberico ham. Meanwhile, lower-quality hams come from pigs fed more modern diets including grains. When we speak of Serrano ham, we're talking about non-Iberico pigs reared intensively and fed lower-quality diets focussed on mass rahter than flavor in the fattening period before slaughter. This means that the flavor cannot compare to Iberico pigs reared and fattened in traditional open pastures. However, Serrano hams are graded based on quality too, with the grades being 'bodega' (cellar), Reserve and Grand Reserve. The term 'serrano' refers to the process of curing the ham in the dry, cold air of a mountain climate. There are four main designations for the origins of Iberico hams: Guijuelo, Dehesa de Extremadura, Huelva and Los Pedroches. Meanwhile, the best-known Serrano hams come from Salamanca, Teruel or Trévelez, though they are produced virtually across the entire Iberian peninsula.